Len Poteshman‘s dreams of being a concert violinist came to an end due to injuries sustained in World War II. 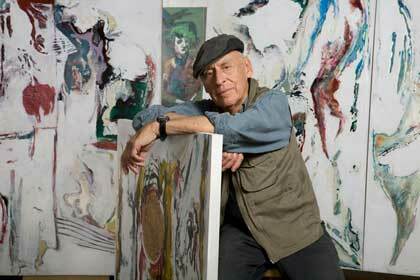 Len pursued an arts education at the Chicago Art Institute, the American Academy of the Arts, Chouinard, and the University of Guadalajara where he received his Masters of Fine Arts degree. Not following a predictable path, Len began a career in law enforcement where he worked undercover solving art crimes, detected forgeries, and did composite drawings of suspects. Retirement has given Len the time to fully explore his creativity. He considers himself “a non-conceptual artist” whose “process of creating provides him with the possibility of bridging illusion and reality.” Len’s work has been exhibited at Los Angeles County Museum of Art, the Riverside Museum, and in Spain, Washington, and throughout California. Poteshman’s in-depth Oral History and Documentation was in 2011. Sponsored by Yvette & Richard Franklin The FOTM Archive contains extensive information about this artist.